Charge across the plains and into a stampede of winnings in the all new Buffalo Rising Megaways slot by Big Time Gaming, licensed by Blueprint Gaming! 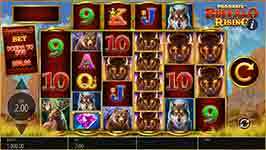 This exciting new 6-reel slot has up to 117,649 ways to win while offering a generous 96.5% payout percentage. Every win triggers a cascade of symbols that can see additional wins added to the original. Bonus features include an incredible free spins round where you can earn unlimited win multipliers! Buffalo Wild Symbol – The Buffalo Wild will substitute or all other symbols in the game except scatters to complete wins. Megaways – Each spin can have up to 117,649 ways to win. Every winning symbol is part of a reaction with cascading symbols from above the reels or from the right of the top symbols. Wins are awarded on left to right adjacent symbols regardless of size. Payouts are multiplied by stake. Free Spins Bonus – Land four or more purple diamond scatters to win the free spins bonus. Triggering the free spins bonus comes with the potential for unlimited win multipliers. The win multiplier increases after every reaction. Mystery Symbol – The mystery symbol is a transforming symbol and can change to any other in the game except the purple diamond scatter. Buffalo Bonus Bet – The Bonus Bet allows you to buy the bonus for the price displayed on screen. When you do buy the bonus, the RTP shoots up to 97.01% !